Yesterday we saw a leaked press image that identified Nokia's Android smartphone as the "Nokia X." Today, the Finnish smartphone maker sent out a note informing the press that its announcement on Feb. 24 will also be available through a public live webcast. 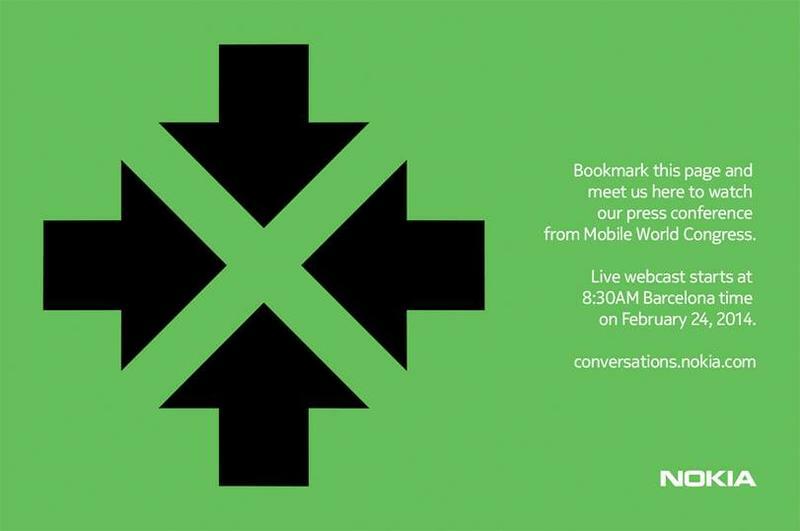 The email had its own teaser that seems to confirm the "Nokia X" branding. You'll note that, in the image above, there's an X in the middle of the logo that's created by four arrows. The arrows themselves don't seem particularly noteworthy, but it's the X that sticks out since that's what we're expecting to be the name for Nokia's first Android smartphone. The device is likely headed to emerging smartphone markets such as India, where it's already in testing, though we'll know more details on where it will launch on February 24. In either case, this is the first time Nokia itself has publicly teased the brand name, even if it is rather subtle. Does the X signify a "crossing" of sorts between Windows Phone and Android? Rumor has it that Microsoft is allowing Nokia to take this route as an effort to bolster its own services, like OneDrive, and to use the X as a gateway into Windows Phone by removing Google Play Services such as Gmail, the Play app store and more. Will it work or will it backfire? We'll see!